Vacuum forming process is a simplified version of thermoforming, where a sheet of plastic is heated to a forming temperature, stretched onto a single-surface mold, and forced against the mold by a vacuum. This process can be used to form plastic into permanent objects such as turnpike signs and protective covers. 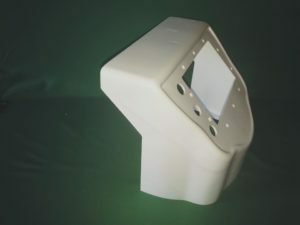 Normally draft angles are present in the design of the mold (a recommended minimum of 3°) to ease removal of the formed plastic part from the mold. Suitable materials for use in vacuum forming are conventionally thermoplastics. The most common and easiest to use thermoplastic is high impact polystyrene. 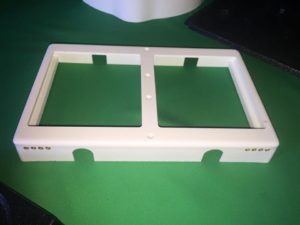 This is molded around a wood, structural foam or cast or machined aluminum mold (expensive ones), and can form to almost any shape. This high impact material is hygienic and capable of retaining heat and its shape when warm water is applied and is commonly used to package taste and odor sensitive products. 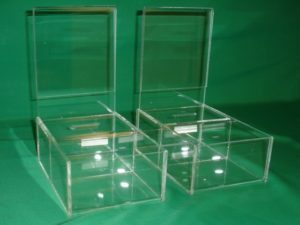 Vacuum forming is also appropriate for transparent materials such as acrylic, which are widely used in applications for aerospace such as passenger cabin window canopies for military fixed wing aircraft and compartments for rotary wing aircraft. 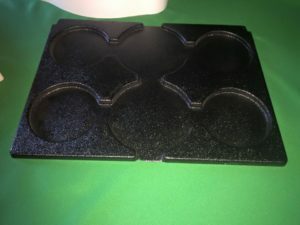 Vacuum forming is often used in low-level technology classes for an easy way to mold. A:Guillotining: The product is cut out of the sheet by pressing a blade through the product into a die underneath. This is a clean way of removing vacuum formed parts from the material sheet. It doesn’t require a special cutting tool to be made for an individual product and is therefore suitable for low volumes of parts where straight lines are no problem. Cutting only straight lines and being a fairly slow approach compared to other finishing methods, guillotining can be expensive for projects with larger, more complex quantities. B:Drilling: If simple round holes are the required finish, manually drilling them is a good solution for small quantities. Drilling guides can be used to ensure holes can be drilled quickly in the right place. As this is a labor-intensive method, it is only suitable for small production quantities. C: Roller cutting: Process whereby the vacuum formed product is placed on a custom made cutter and pushed through a roller cutter machine. 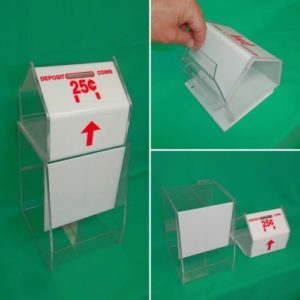 An efficient way of cutting vacuum formed items from the original sheet of vacuum forming material. The cutter can also cut any necessary holes, such as cable or access holes, at the same time. Roller cutting is suitable for fairly large items, where precision alignment is not required. As the vacuum forming and the cutter are rolled sideways through the roller cutter machine, some misalignment can occur. Roller cutting can’t be used for making holes or features in the sides of vacuum forming, as the cutter tool always cuts vertically from the bottom. D: Press cutting: This is a very precise method of cutting which uses a press and a custom precision made cutting tool. This method is very suitable for items where the roller cutter process wouldn’t achieve the precision required. 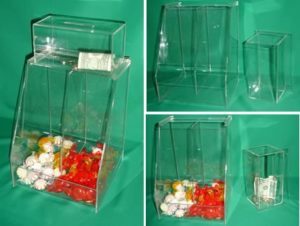 It’s often used for punching very small finished items out of a plastic sheet, rather than punching features into a product. Press cutting can’t be used to make features in the sides of vacuum forming. E: Cutting with a CNC machine: Machining is a very precise method of creating holes & features. The real advantage is that it can be used to create features in the sides of vacuum forming, e.g. guide rails for a tray that needs to slide onto shelving. It can also cut sidewalls of a different depth than the pockets – something which cannot be done with roller or press cutting. 1/Absorbed moisture can expand, forming bubbles within the plastic’s inner layers.This significantly weakens the plastic. However, this can be solved by drying the plastic for an extended period at high but sub-melting temperature. Webs can form around the mold, which is due to overheating the plastic and so must be carefully monitored. 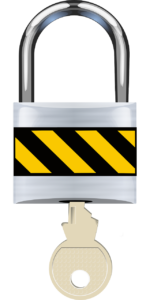 2/ Webbing can also occur when a mold is too large or parts of the mold are too close together.